Marco Rubio's meager offerings for working parents are still the best in the GOP field. Marco Rubio at the Nov. 10, 2015, debate in Milwaukee. Tuesday night’s Republican presidential debate didn’t touch much on workplace issues like child care and paid family leave, and for good reason: Nearly every candidate on the stage thinks the federal government should not get involved in such matters. 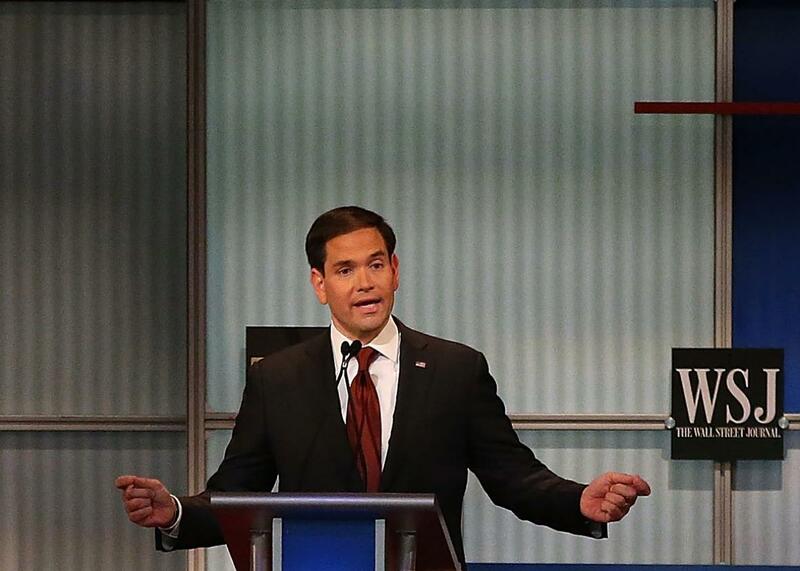 Sen. Marco Rubio, who gave one of the debate’s strongest performances, is a stark exception. His tax plan includes a new child tax credit up to $2,500 per child, available to single parents making up to $200,000 and married parents making up to $400,000 total. Rubio positions the tax credit, which the Tax Foundation says could cost up to $170 billion a year, as a way to help working families manage the rising costs of child care. This kind of relief, through tax credits or otherwise, is desperately needed. Despite the fact that child care workers often don’t earn enough to make ends meet, in nearly 81 percent of the country, child care for two kids costs more than rent. This harsh climate encourages rational economic actors—that is, women—to stay home with their kids rather than enter or re-enter the workforce, which is no good for families or the economy at large. But Rubio knows the program could chafe conservatives. “Isn’t there a risk you’re just adding another expensive entitlement program to an already overburdened federal budget?” asked moderator Gerard Baker of the Wall Street Journal Tuesday night. But as the Republican candidates scramble to win over female voters, Rubio has stood alone on policies that advance family-friendly workplaces. In addition to his proposal for child care relief, Rubio has put forth a proposed set of tax breaks to encourage businesses to offer paid family leave. None of the other candidates have voiced any support for federal action on the issue. Unfortunately, Rubio’s paid leave plan would likely work better in theory than in practice. Tax breaks installed to nudge companies to treat their workers better have rarely succeeded. Since 1981, for example, the federal government has extended a tax credit to businesses that offer onsite child care; today, only 7 percent of companies do. And because of the way businesses work, the parents who need paid leave most—those working low-wage, hourly jobs—are the least likely to work for companies who’d take the tax break under Rubio’s plan. Still, given the bleak landscape of GOP candidate proposals on child care and paid leave, Rubio has cleared the terrifyingly low bar to become the party’s best candidate on policies that support working families. Add that to his brutal stance on reproductive rights, and a Rubio Republican nomination becomes an even gloomier prospect.